Home » Blog » Should my website be mobile responsive? Every year billions of people around the world connect to the internet to check their emails, Facebook feeds, do online shopping and ask Siri about the meaning of life. With such significance influence around the world we can be assured that the internet will be around for many years to come. With advances in technology happening so quickly, however, it’s no wonder that the way people access the internet is changing rapidly, especially when it comes to mobile. The term “mobile ready” refers to whether or not your website works the way it should on a mobile device such an an iPhone or Android smartphone. If you haven’t heard the term “responsive” before, it’s simply a ‘techy’ term to say that no matter which device a person uses – whether it be a computer, laptop, iPad (tablet) or smartphone – when they open your website in a browser, they will have a consistent experience. This user experience may be slightly different on each device since each device is slightly different and the way people use them is different, but the overall experience and message will be the same. Why it is important to optimise for mobile? It’s important to consider that mobile devices are different to computers. Their size is different; the screen is generally much smaller. The way we use them is different; with highly responsive touch screens and hands-free voice activation. And most importantly the experience we have with them is different; in the ways we navigate websites and social media. One example of a current website which was never optimised for mobile is the original Space Jam website made in 1996. Produced almost ten years before the iPhone 3, and long before the idea of “responsive” was even considered the Space Jam website is an artifact of how a non-responsive website looks. When you go to the Space Jam website on your mobile it opens in the exact same way as it does on the desktop, however when looking at it through a mobile device many of the features, while looking the same, give the user a less immersive experience. Most notably the screen is scaled down making the images indecipherable without zooming in manually and there is no clear direction about how the website should be navigated. These days the complexities in modern websites have increased considerably and many features designed for a website may only work properly on a desktop or laptop. This can not only result in a negative experience for the mobile user, but can mean that the user will avoid the website in the future. Mobile first is they key. In 2017 the major shift is towards Mobile First. Mobile first is the term to say that all elements in the website design processed should be tailored specifically for mobile and tablets first with laptops and desktop computers second. The main reasons are to do with screen size – it’s a lot easier to pack in the information you want onto a desktop screen than it is onto a mobile. Mobile devices are, however, developing a commanding preference globally when compared to desktop and it is vital for businesses to adapt to this evolution. As of October 2016 mobile and tablet devices overtook desktop as the preferred internet technology with 51.3% preference mobile and tablet to 48.7% desktop globally. That’s some significant numbers for technology which could still be considered in its infancy. But the trend is all going one way with Statista estimating that by 2019 63.4% of mobile users will use their mobile devices to surf the internet. These are big numbers considering that by 2019 it is estimated that by 2019 one in every two people will have access to the internet. With the excelling of mobile usage comes very exciting opportunities to create a unique user experience for customers who are using mobile. Mobile first is all about guaranteeing that your customers have the same (or better) user experience on a mobile device than they would on a desktop or laptop. Looking at the preferences towards mobile is an essential component of the web design process. Google intends release a mobile index for websites that are optimised for mobile meaning that websites not optimised for mobile may not be indexed properly for search requests made on mobile devices. To find out more Rick Elenbaas has a great article about the mobile index and why it’s important for your business. 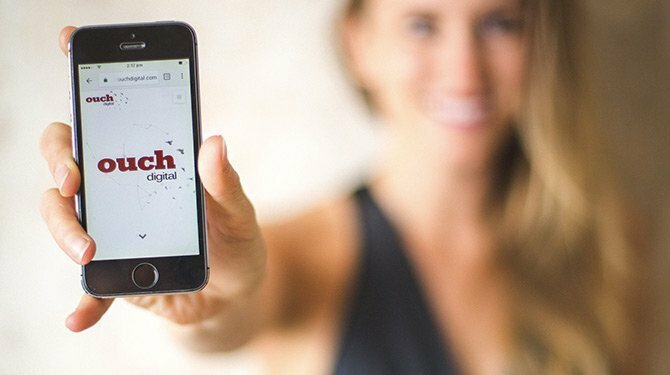 At Ouch Digital, we recommend to all of our clients to go mobile first. If you have any questions about whether your website should be responsive for mobile, or have a project you’re interested in, contact us about how we can help you with your project. As part of our expertise, we build a website that is responsive, functional and engaging for your customers.